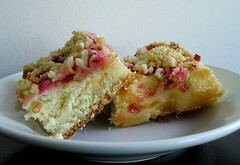 Rhubarb Crumble Kuchen - Do You Know The Muffin Man? Notes: 13×9" pan works OK even though recipe asks for 30×20 cm. Alarming syrupy runoff in the corners of the pan, but it turned out alright. Nice tart/sweet contrast. Mixed in some apple too. Britishisms: caster sugar = superfine or fruit sugar; easy-blend yeast = instant yeast.